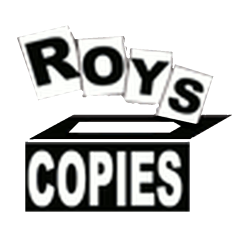 Roy's Copies is an independently and operated business specializing in copying, printing, and shipping since 2005. We are located in the Brandermill Business Park, Monday through Friday 8:30 - 5:00. We are an authorized FedEx outlet, and can ship ground or air. You can also drop off pre-paid packages for delivery and they will be picked up same day if received before 4:00.